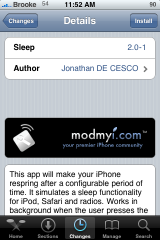 Sleep is an application that will automatically respring your iPhone or iPod Touch after a user specified amount of time. When you open Sleep, you will see two scrolly wheels…one for Hours and one for Minutes. You can use them to choose how long you would like before your iPhone/iPod Touch resprings. Let’s say, for example, 1 hour and 30 minutes. Once you have chosen your amount of time, select Start in the lower left corner. This will bring up a Z.z.z.Z icon at the top of the page as well as the amount of time that is left before it resprings. Now, to actually enable Sleep, you will need to press the Home Button to exit the application (not the Exit button in the lower right corner). If for some reason you would like to Exit the application without enabling Sleep, you can use the Exit button in the lower right corner instead of pressing your Home Button. Also, if you have started the sleep process and would like to stop it, you can open the application and you will get a pop-up that says if you would like to stop the process, just use the Exit button. So, you would Dismiss the message and then use the Exit button in the lower left corner and that will end the Sleep process. The nice thing about this app is that when it resprings your SpringBoard, it brings it to the lock screen. Which means, if you want to listen to music as you fall asleep and you set Sleep for 30 minutes, it will respring to your SpringBoard and lock the screen. That way, it does not sit unlocked and drain your battery all night! Every time I have tested this application, it worked great. 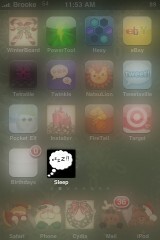 In one test, I started my iPod and then let my iPhone sit, like I would if I were going to sleep. In five minutes, it nicely resprung my iPhone and brought it to the lock screen where it then locked. Very nice! I tested it a few other ways as well and each time, it seemed to work nicely. Kind of a handy little app to have around! Ok so if you fall asleep while your listening to music it will shutdown and lock, but what else would this be good for? The app must be useful for other options right? About time!! I was hoping smthg like this would come out since 1.1.x Not exactly how I wanted it implemented. 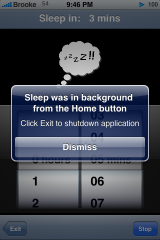 I was thinking that it should have been integrated with the default timer application and that it would add additional menus as to the application that you want to kill and not just the “sleep ipod” that we get. good app nontheless. its good for a lot of things, first of all: Pandora sleep timer. or any other music app that doesn’t have a sleep timer built in. Yeah, me 2, i dont really know what this app does? Cant the Clock Application already do this? Poweroff would be much nicer. 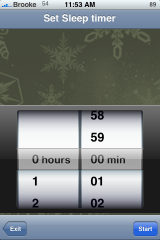 isnt this what the timer app does? …expect this is all that it does……….